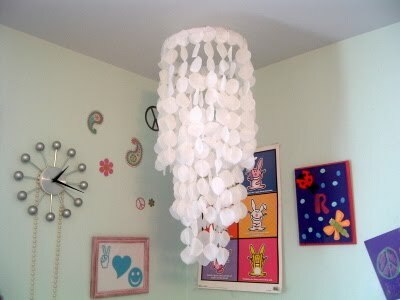 Another DIY almost faux capiz-y chandelier. Couldn't resist this one though because it requires NO CUTTING OF A ZILLION LITTLE CIRCLES. Angie at Country Chic Cottage used dollar store rose petals (you'll need about eight packages) for this one, along with embroidery hoops and some fishing line. There should be some sort of Nobel prize for Crafting that Avoids Tedious Manual Steps. Angie, I nominate you. And toss some rose petals your way. I would love to use this in a patio... so pretty in the wind! Pretty... I am all for the shortcut route as well!